Indulge in a creamy, steamy cup of chocolatey goodness. Few things are better than curling up with a hot cup of cocoa when the temperatures drop. These hot chocolate recipes (and add-ons) will keep you cozy — fireplace or not — regardless of your relationship status. In the past, Prep & Pastry served hot chocolate with peppermint marshmallows on the weekends. They were sought after and although they are no longer served, we have included the recipe so that you can try your hand at them. In a small bowl, sprinkle gelatin over ½ cup of liquor to bloom. Mix sugar and corn syrup with 1/3 cup water. Place on heat. In bowl of an electric mixer, pour the egg whites and beat on low speed until frothy. When the syrup reaches 210 degrees F, increase the speed of the mixer to high and beat until thick and fluffy. When the syrup reaches 245 degrees F, slowly pour the hot syrup into the egg whites. Scrape the gelatin and water into the pan you used for syrup. Swirl to dissolve. Pour the gelatin slowly into the egg whites as they are whipping. Add vanilla extract and continue to whip until the bowl is cool. Add the food coloring and use a rubber spatula to swirl it in. Be sure not to over mix because you will lose the swirled effect. Dust a baking sheet lined with a nonstick silicone liner evenly and completely with a generous layer of dusting mix. Leave no bare spots at all in order to prevent sticking. Dust your hands with the dusting mix and use your fingers to press and spread evenly (or use an offset spatula). Dry for at least four hours uncovered or overnight. Dust the top of the marshmallows with the dusting mix. Cut into your desired size. Toss the pieces in dusting mix and dust off the excess. Hot chocolate from Chef Augustine Sanchez at Hacienda del Sol in Tucson, Ariz. This elegant inverted variation of hot chocolate is best enjoyed with a straw to capture all of the layers in one sip. In a small saucepan, melt the white chocolate with cream until smooth to create a ganache. In a medium saucepan, combine the milk, half and half, cream and diced jalapeño. Omit the seeds if you want less heat. Bring the mixture to a gentle simmer. Add the dark chocolate, milk chocolate, and Grand Marnier. Pipe a small amount of whipped cream in the bottom of the glass. Evenly cover the top of the whipped cream with the prickly pear syrup to create a layer. Pour the white chocolate ganache on top to make another layer. Slowly pour the heated hot chocolate mix on top of the ganache. This recipe is simple but will still impress, as long as you stick to quality ingredients and use freshly whipped cream. In a small saucepan on medium heat, combine the half and half and dark chocolate. Remove from heat. Add your preferred sweetener to taste and a splash of vanilla. Top with whipped cream and dust with cocoa shavings. Rebecca Wilder, wife of Chef Janos Wilder, developed this recipe for their personal holiday card a few years back. In a medium sauce pot, whisk all ingredients except the Kahlua and bring to a slow simmer for 5 minutes. Whisk well to incorporate all the ingredients. Remove from heat, stir in Kahlua, pour into mugs, and garnish with cinnamon sticks. Mud sauce: In a medium saucepan, bring all of the ingredients before the peppermint extract to a boil. Let the mixture cool overnight. Once it is chilled, stir in the peppermint extract. In a medium saucepan, heat one cup of heavy cream and one cup of milk over medium heat until it just begins to simmer. Stir in 3/4 cup of the mud sauce and bring the mixture back to a simmer. Like the taste of bacon? Whiskey? Nutella? Make this recipe from scratch to enjoy America’s indulgent flavors in one cup. View full recipe on Serious Eats. This recipe from world-renowned Bouchon Bakery has a little secret something — coriander seeds. View full recipe on Delish. Le chocolat chaud gets its richness not from cream but from the best chocolate you can get your hands on. View full recipe on David Leibovitz’s website. Masa harina lends body to this Mexican breakfast chocolate drink. View full recipe on reganbaroni.com. 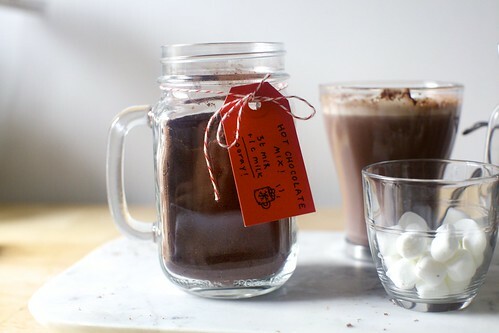 If you’re a little late on Christmas gifts, try handing out jars of this hot chocolate mix. View full recipe on Smitten Kitchen. Have a favorite place in Tucson to get hot chocolate? Please let us know.